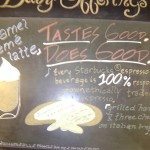 The previous chalkboard art blog post inspired the reader to write to me because she was excited to share with me her artwork at her local Starbucks. 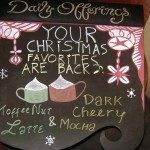 I want to point out, she is a customer who regularly draws the chalkboard art in the store! She sent me some pics, and so I want to share her talented creations. There are a couple of interior store pics attached. It is worth noting that she is in a store with a La Marzocco espresso machine. The distinctive espresso bean hoppers seen in the pic give away that the store uses a manual or semi-manual machine (of course it could be another brand espresso machine). (See photo). They usually have a different “campaign” every quarter, but lately they shortened it to 7-9 weeks. 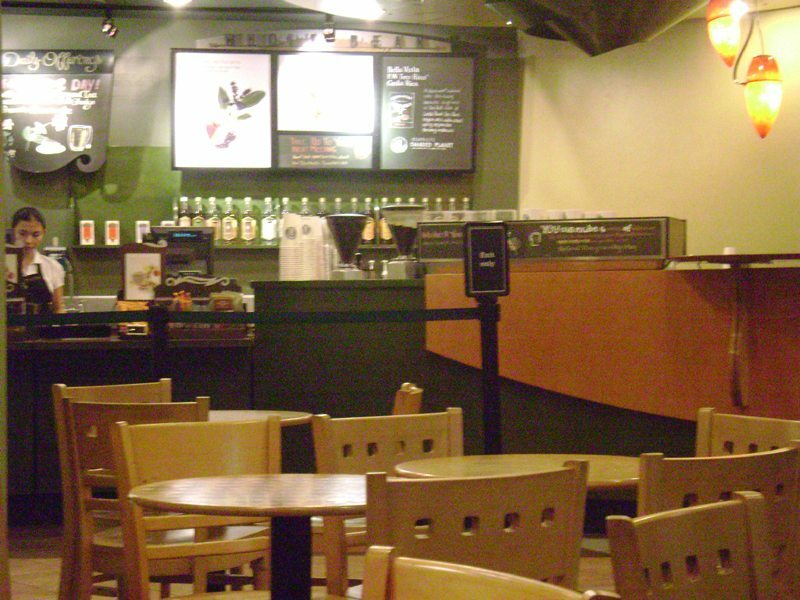 An example of a typical campaign was the Dark Roast Coffee Jelly Campaign, featured last July 22 – September 20, 2009. The featured beverages all had the “new” coffee jelly: Dark Roast Coffee Jelly. The jelly is smoother in taste and a bit amorphous – not like the usual cubed Coffee Jelly. The featured whole bean coffee was Tanzania (sadly not my type, still tastes great). A campaign that everyone looks forward to is the Christmas Campaign. A lot of people flock to the stores because a planner is being given when you purchase the required number of drinks. Like the Bold Coffees in the USA, this is accomplished thru the “stickers.” I can send you pictures of the planner if you like. This winter (Jan 06 – Feb 22, 2010), Guatemala Casi Cielo was the featured whole bean coffee, and the featured drink is the Honey Orange Latte and Honey Orange Mocha, which means that Valencia was back (for the meantime only). I was so happy since Valencia is my favorite syrup. The current campaign is Tea discovery, which runs from Feb 23 – April 19. 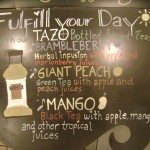 Featured beverages are the Full-Leaf Tea Lattes, and the featured whole bean coffees are Bella Vista F.W. Tres Rios Costa Rica and El Salvador Pacamara (formerly a Black Apron exclusive). For the next campaign (starting on April 20), the featured beverage is Espresso Java Chip Frappuccino (I think). It features a different type of whipped cream: Espresso Whipped Cream. The featured whole bean coffee is Sumatra Mandheling and Sumatra Siborong-borong. 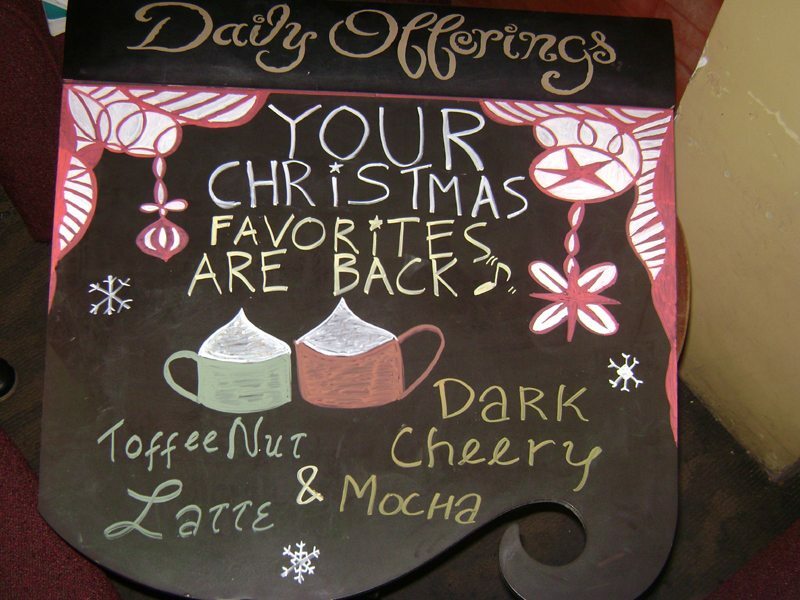 Reading that list of promotional drink and coffee offerings makes me a little jealous. I may be in Seattle, but occasionally I feel like I’m a step behind what’s happening in the international markets. Espresso whip cream sounds so good! I think it’s the funniest thing to see pictures of a store that’s on the other side of the world, but looks exactly like the store design of two stores in my area. We have a good range of old and new in my area but the colors and fixtures are definitely of a particular vintage. Also funny to see the food pairing directive out there as well. “Make this beautiful sign exactly like the picture.. and then shove in some food as an after thought.” I really wish that directive would die off. Another interesting thread! 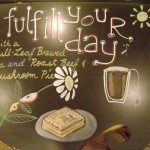 I have wished for quite a while that I (a customer) could do the chalkboard at my regular store….there are SO many possibilities. I think it would bre great fun and look much better than the minimal, which is usually what it is now. but, I don’t feel right about approaching the store about this…. 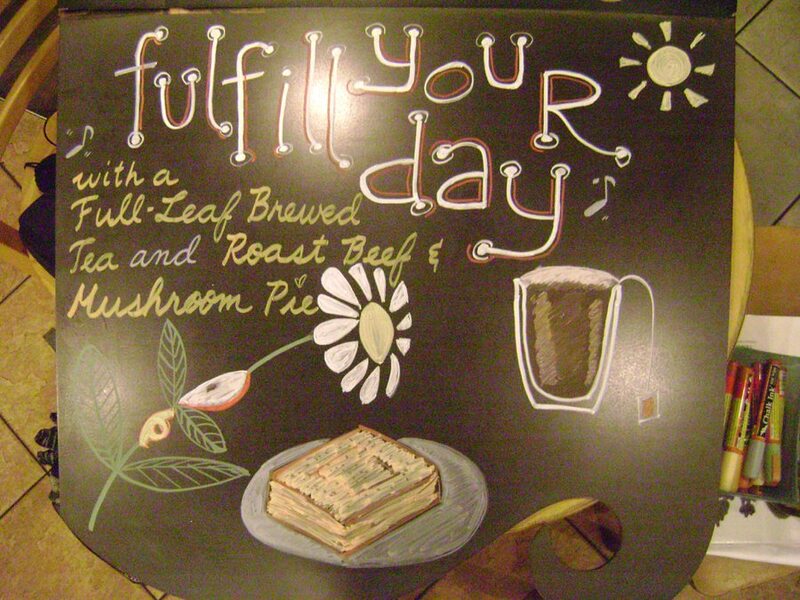 these chalkboard art boards are surely more creative than the ones I have seen around here. Actually, I think it would be a neat idea if customers with some art design background would get a chance to design a board. Maybe each local store can have a promotion or contest asking customers to submit their designs? 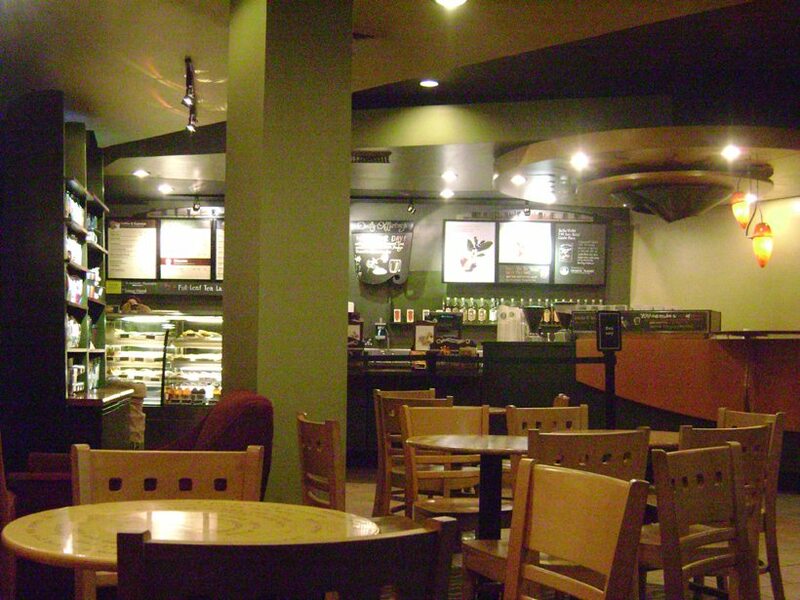 I think what I find so amazing is that not matter where they are , starbucks are still the same-different, yet the same. Espresso whip cream sounds amazing! 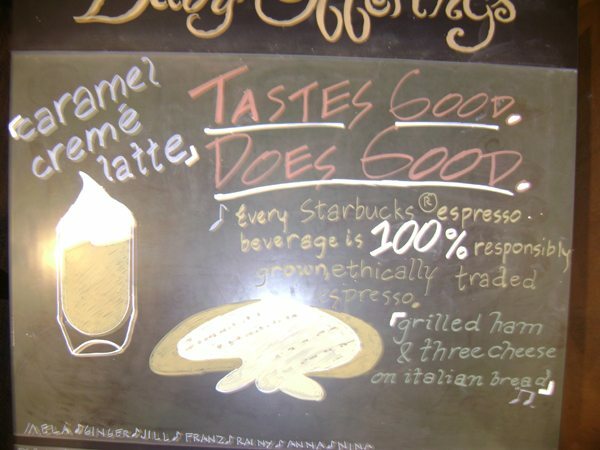 Mmmm, I agree with CABarista, espresso whip cream! Melody, I too want to congratulate on reaching 100! I read the thread so fast that I missed your mention of it. 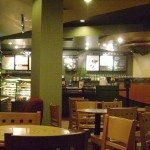 This is a great blog and the info you provide is invaluable. Good luck and continue with it. I was in Puerto Rico last summer and the stores there still carry the Dulce de Leche syrup from a few years back. I think it’s a core offering. It also tastes much better than the beverage we carried…The exclusive Puerto Rico blend coffee is fantastic too! Congratulations on your 100th posting…keep up the great work!!! Wow Melody, 100 posts! It seems like just last month that you started this website! I am so happy that you are doing something that you love, and doing it with such excellence and passion! As to the Philippines post, I found it most interesting too that the espresso machines did not appear to have hoppers as a part of the unit, but as a separate grinder, implying that the espresso would be ground out of those machines, tampered and then the shots pulled on the machines. 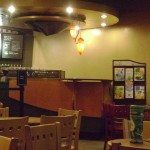 i would love to see a picture from the Barista’s perspective! 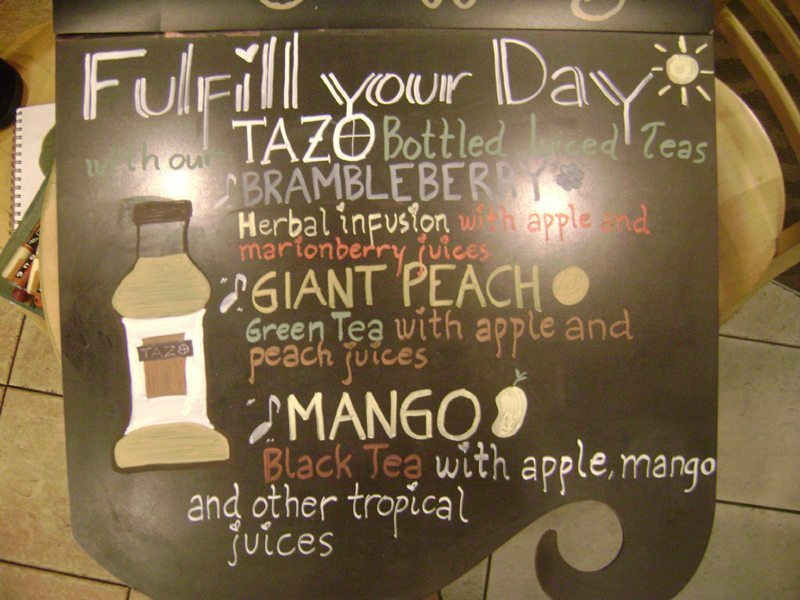 Another thing that I found interesting is that Starbucks let a customer draw the chalk board! I suppose it makes sense that if things are as tight labour wise down there as they are up in Canada, why not let a customer who theoretically has all the time in the world make the sign. However, I just have to say that if that ever happened at my former store, my SM would have a FIT! Heck, there was one evening that we were doing our soft rollout for the Dark Cherry Mocha, and the girl who normally did the sign hadn’t done it, and had gone home for the day. I took it upon myself to create the sign, despite my insecurities regarding my art skills. Well, I did a pretty good job. It looked good and didn’t take a lot of time. Despite my best efforts, the next day when I came in, my sign had been erased and a new one had been made. Needless to say, I was quite mad as I had spent a fair amount of time that evening working on it. I later discovered that my SM didn’t like it (despite it is exactly what the company sent over), so she had it erased and wasted more labour, and had it re-drawn……anyhow, I digress. Happy 100th post Melody, and I certainly look forward to 100 more! I would love to go to the Philippines some day…they have amazing stores there. And the chalk art looks fantastic! Gr8 post from around the world. It’s nice to know that out there somewhere the rare coffee that we used to get as Black Apron selections are still available in certain places. I understand why a region would have “local” offerings like Valencia, Coconut and even Dulce de Leche sauces, but it sure angers customers that travel and come back to their neighborhood store and want to know, “Why can’t I have that here”, for which the next comment is ALWAYS, “Well you should tell SBUX….” for which I always respond with a MSI retort. I had a man yell at me the other day because SBUX doesn’t have de-caf black tea for his pregnant wife who is craving it and probably driving him nuts about it. I really wanted to tell him to walk down the sidewalk to the grocery store, buy his wife some tea and stop yelling at me for it, make your wife happy yourself and don’t berate me because of decisions far beyond my control. Ok, rant over. Time to grind, keep posting. I learn so much from you, truthfully. Wow! 100 posts already! And you said that you weren’t sure you’d have enough content. THANK YOU for such a positive and informative blog. Here’s to the next 100! i wonder if there is any added sugar in the espresso whipped cream? has it really been 100 posts? wow, time flies! Put some Via (Colombia’s better than Italian in my opinion) in your whip cream. It’s delicious! A coffee master in my district paired that whipped cream on top of some marble pound cake with Mexico Chiapas… SO GOOD!!! Way to go Melody, 100 posts!!! Once again, Melody delivers! Aside from espresso whipped cream (I’m gonna follow camspi’s advice and throw some Via Colombia in a whipped cream canister tomorrow), I liked seeing the Caramel Creme Latte and Chicken Hoisin Wrap. Also, I wanna try coffee jelly. 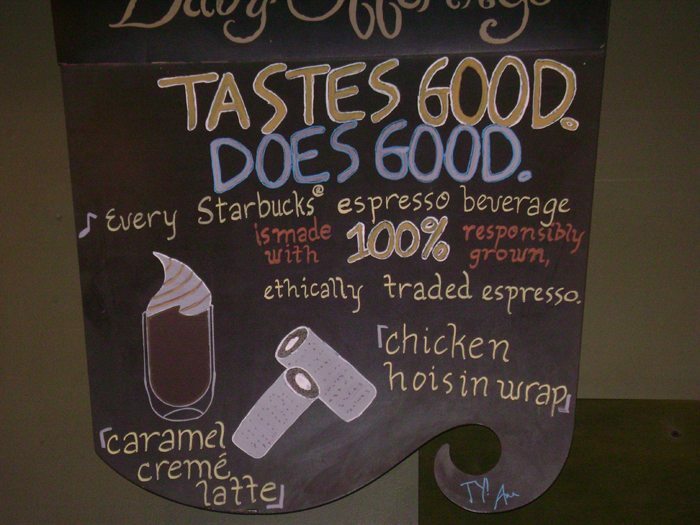 I seem to remember seeing something similar on the Japanese Starbucks site. 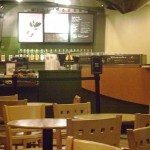 If anyone who’s been to a Filipino or Japanese Starbucks (or any other Starbucks market where they have that sort of thing), is the “coffee jelly” like the “jelly pearls” or “boba” that you can sometimes get at assorted Asian food joints here in the States; giant black oversized tapioca balls, except with coffee flavoring? Hey I definitely want to say a big “thank you” to everyone who sent me props for 100 blog posts. For those who might be worried about the few times I’ve turned emails into blog posts, that’s always been done with the consent of the original writer! Sorry that I don’t know anymore about the coffee jelly than what’s in this blog post. nope, it’s not even spherical. it’s just…jelly. Congratulations on having 100 posts! And to think it would coincide with this entry. 😀 Here’s to more in the future! I would have an absolute blast if I got to draw the chalkboard art around here. That would certainly bring the Starbucks/ customer connection closer. Also, then they wouldn’t have to worry about the labor involved with drawing the chalkboard art. 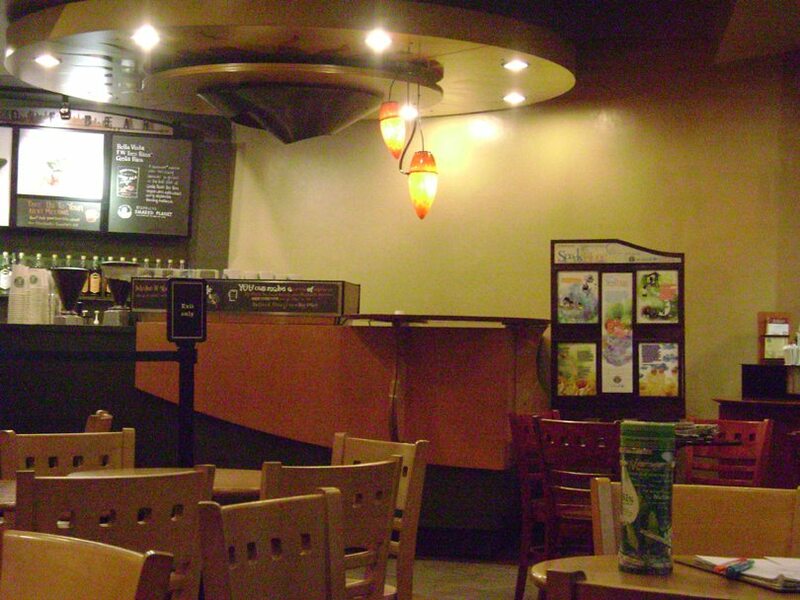 @enlightened coffee sage: nah, the coffee jelly is just… jelly. 🙂 Think of jelly cut up into bite-sized cubes in your drink. The coffee jelly beverage is served with a special straw to help you scoop up the jelly bits.